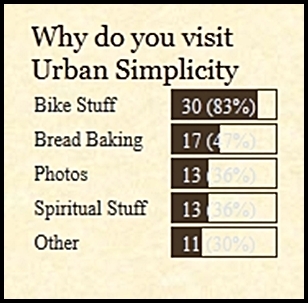 Urban Simplicity: The Polls Are In...and thank you. The Polls Are In...and thank you. Last week I posted a simple poll--as I do every year or two--to get a guess as to why people visit this little idiosyncratic blog (surely it's not for my nonsensical ramblings). Firstly I want to say thank you for visiting this blog in general, but also thank you to those who took the time to partake in the poll. Anyhow, three dozen people responded and I find the results interesting. It appears that 30 people (or 83% of the poll takers) still visit this blog for bicycle related posts. Excellent. I thought I lost you (or at least a lot of you). This blog, as are all things I suppose (including myself), is a work-in-progress and is not as bike-centric as it once was (see my very first post here). I like to think that it has morphed into a sort of open journal or weblog (the original name for blog, of course) of what has happened in my life each day or every other day, or at least a small slice of it. But I do know that when I post about things that can be carried on a bike they still get a lot of views (thank you). This doesn't surprise me, but what does is that the number one reason people visit this meager blog was not bread baking...when on a daily basis it is. Below is a screen capture which pretty much represents what I'm talking about. 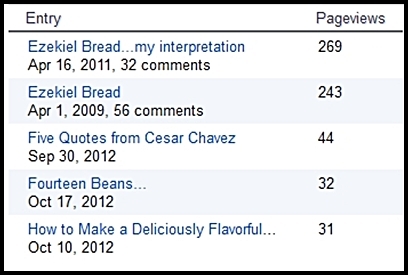 The two most popular visits to this blog consistently are for Ezekiel Bread. And after I thought about it, this must be for a couple reasons. The first being that the bikers are more opinionated (I mean this in a good way) and took the poll but not many bread bakers did (wut up bakers?). Another reason (I think) is that the recipes for the bread are good, really good if I do say so myself (there are a lot of really bad Ezekiel Bread Recipes out there...and yes, I am typing with one hand right now because the other is patting myself on the back), but also I'm sure that the recipes for the bread are linked in more than a few places so people find themselves here directly through those links specifically. Also what I find interesting is that over the years more people have visited for photos and things spiritual (36%)...this make me glad on a few levels. Anyhow, in the same way that a person may mutter to themselves, sort of talking a loud unconsciously, this is what I'm doing now but through words via this electronic medium. And I thought I'd share. Thanks again for visiting. Peace. It was hard to pick one answer. I really wanted to pick them all. The whole "feeling" of your blog has me coming back for more. Excellent! Thank you so much for your kind words.